The NY Times' crack reporter in Chicago--nuance means you can't see the nose on your face. You can't talk about Illinois without Chicago [note colored map]--and Chicago is bankrupt too. It has very high taxes. And very poor schools run by the teachers' union for its benefit, yielding an unskilled workforce and crime-ridden neighborhoods. Then there's Cook County, otherwise known as Crook. It remains to be seen whether that will change. 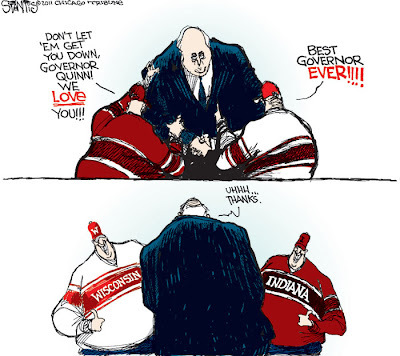 Corruption and patronage are the name of the game at every level of government in Illinois. Minnesota may high taxes but they also have a high level of services, delivered A-rated living within their means. Indiana has among the lowest tax burdens in the country. And Wisconsin's new Republican governor, the former reformer of Milwaukee County, is taking a look at privatizing as much government as he can, and boosting economic development. Chicago's Cook County and (on the watch list, Madison, St. Clair and McClean county) Illinois have the dubious honor of ranking high as judicial hellholes. And while other big Blue states like New York and California are actually making spending cuts, Illinois continues to ramp up spending--even as our retire in your 50's public employee pension burden is the most underfunded--and probably the most undeserving--in the country. People and jobs have been leaving Illinois for years. Voting with their feet. As plain as the nose on your face. If you're honest. Illinois Republican Party Chairman Pat Brady said in a statement that he’s not buying Quinn’s claim that Gordon’s appointment came after the vote. “That’s like saying it was simply a coincidence that the governor vetoed McCormick Place reforms last year after getting a $75,000 donation from the Teamsters Union,” Brady said in the statement. UPDATE: Thanks for the link, Newsalert. And Pundit & Pundette for highlighting my blog these last few days. Always a good read.